Roulette looks complicated to new players but it is actually one of the simplest games out there. There are only a few basic things you need to know in order to play roulette online and, with a quick look at the different bets available to you, you'll have nearly all of the bases covered. Then, learn about the different variations to learn how to play roulette online with the best odds possible! In general, it is easier to play roulette online than in a land casino. You don't have to worry about the table etiquette, there are fewer distractions, and nobody will accuse you of cheating! All you have to do is select your chip size, place your bets on the table layout, and tell the software to go ahead and roll the ball. A random number generator will ensure that the ball lands fairly and, if you're using trustworthy software, it will always pay out correctly: there should be no risk of dealer error. Now, if you want to enjoy roulette on the net and win, there are a few other things that you should be aware of. Roulette is a pretty simple game, but it's a game with a variety of bet options available. Before you get started with the game it's important to understand how betting in the game works, how to place various bets and what type of winnings you can expect to gain if you succeed with your bet. The Table Layout tables explain how both the American and European style tables are laid out and what options you have available to you. 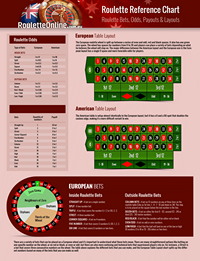 The Roulette Odds chart explains what your odds are of succeeding at each bet type. For instance, when playing on a European table you have a 1 in 12.3 chance of winning when you place a Street bet, or a bet on three consecutive spaces. The Roulette Payouts section explains how you'll be compensated depending on the type of bet that you choose. When you bet on Red you have a chance to double your money. When you place a Split bet you'll receive 17 times your bet back if you win. Spending some time learning this chart will help you understand how roulette works, and how to play exactly the way you want to. When you play online you can keep the table right beside you as you play, and rely on it to help you make valuable decisions, but first you'll have to read it over and learn how to use the different sections and become comfortable with them. Roulette is a generally fair game, with a moderate house edge, and it absolutely beats a lot of potentially good games (including blackjack) if you aren't exactly an expert. That's because, when you're learning how to play roulette online, your strategy can be simple. Basically, there are inside bets (the specific numbers) and outside bets (even money bets like even/odd and red/black). These all offer the same house edge (with the minor exception of the basket bet), which may be either 5.26% or 2.70%, depending on your chosen variation. When you begin playing roulette online, you don't have to worry about too many details. The only thing that deserves a lot of attention is which variation of roulette that you choose. This is what determines your house edge (in a significant way) and it should be the most important aspect of your strategy as you learn how to play roulette online. A lot of casinos offer American roulette, but with two green pockets on the wheel, this variation favors the house in a big way. It has a 5.26% house edge, which isn't horrible, but it pales in comparison to what you'll find with a European or French roulette wheel. These only have a single green pocket, and they often have a beneficial rule called En Prison (or La Partage). This reduces the house edge on all of your bets to 2.70%! So just trust the math and avoid American roulette altogether. Since you're going to play roulette on the internet, all variations will be available - a luxury which isn't necessarily true in land casinos. So, now that you know how easy it is to play roulette online, all you need to do is decide which site is right for you. The sites listed here are ideal for anyone that is still learning how to play roulette on the web because they have simple software, great bonuses for new players, and reputations that you can trust. Best of all, it's free to sign up, so you can take any of these online roulette casinos for a spin today! There is absolutely no commitment!